When it comes to talking about his son, Chris Jeter wears his emotions on his sleeve. On Wednesday, the proud father watched Chase Jeter officially sign to play basketball at Duke University next season. That work has translated to a rise in the recruiting rankings for the Bishop Gorman senior. Two years ago, Jeter was a solid recruiting prospect, ranked in the 30s. Today, he he’s currently ranked ninth in the ESPN 100 for the class of 2015, and was one of the most sought after recruit in the country. A gradual growth spurt has helped a long the way. As a freshman, he was listed at 6-foot-7. Today, he’s listed at 6-foot-10, and that might be estimating low. 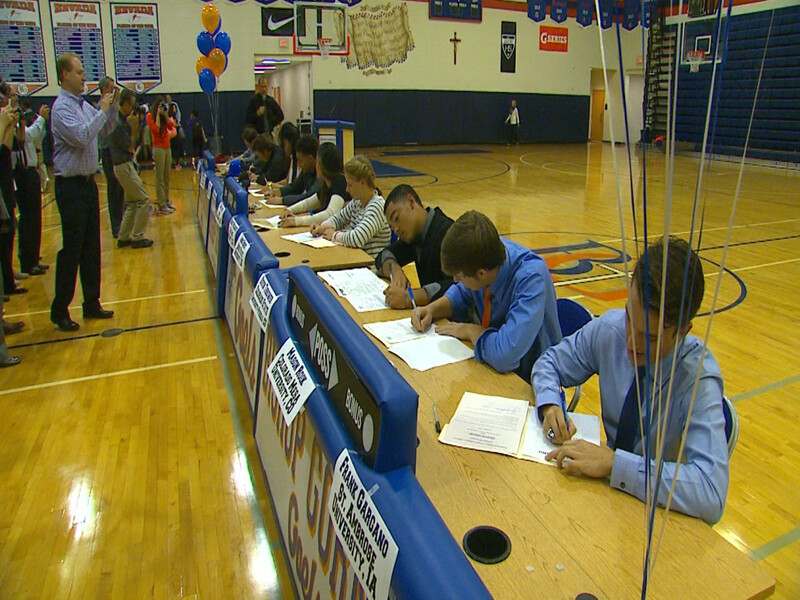 Jeter headlines a strong group of Las Vegas basketball players signing national letter of intents on Wednesday. Las Vegas High forward Ray Smith, ranked No. 24 in the ESPN 100, signed with Arizona as did Findlay Prep guard Allonzo Trier, perhaps the top shooting guard in the nation. Smith’s Las Vegas High teammate, guard Devon Colley, signed with New Orleans. The school plans to have a celebration some time next week. Canyon Springs’ Jordan Davis will be heading to Northern Colorado, where he’ll play with former Valley Viking Spencer Mathis. Former Desert Pines forward Nate Grimes will play for a familiar UNLV foe, as he signed with Fresno State. At Centennial, a pair of Bulldogs overcame some tough obstacles before signing. Guard Darrian Traylor signed with UC Irvine, despite missing his junior season while recovering from a torn meniscus. For Garett Scheer, there was no battling an injury, but rather perception. Scheer will also return to Vegas as an opponent to UNLV. He signed with Air Force. With all the recruits, there were many common threads: nerves before signing, relief after signing and passionate excitement to be able to continue to play the game they love.